Bacauanu Mihail – God Bless, Father and thank you for letting me interview you. The first question would be one that tempts everyone to ask someone like you. How did you become Orthodox? I think each one of us has a „story” that made them go to Church. Some were atheists and started believing, others converted from Catholicism or Protestantism. But in your case, like that of Seraphim Rose too, the „conversion” is as surprising, as it happened in a place mostly not knowing Orthodoxy. Am I right? I understand that at the age of 12 you started asking yourself questions about life and a bit more later you started in search of God in other Christian denominations, that were closer to you. What do you think made you start this journey, this search, and why did you follow it? How come you did not search for God in science or philosophy? 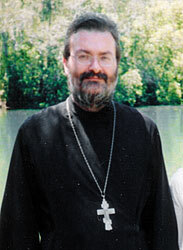 Father Andrew – It is true that there was no logical reason for me to join the Orthodox Church. I was not brought up in any Christian confession and my father was not baptised at all. However, when I was a child, I was sensitive to the world around me and I felt that there was another world near this one. This world was just beyond the visible world, an invisible but parallel world, which was full of good presences and which in fact was the real world, for the visible world was just an illusion. As I grew older, I wanted to understand what that world was and how it related to life and death, where I had come from and where I was gong to. So I began reading about all sorts of ideologies, including Communism, but also about religions. So I discovered the Gospels, which I read for the first time when I was thirteen. When I was fourteen I realised that I was a Christian and unconsciously always had been a Christian. Then I visited different churches around me, Protestant, Anglican, Roman Catholic, but I did not feel the presence of that other world in them. They were all the same. I then learned that there was one church where I had not been, the Orthodox Church. I read about it and said to myself – this is where I have always been. It was only when I was 16 that I managed to visit an Orthodox church, far away from my home. I knew as soon as I entered that church that I was at home at last, this was where I had always been in my soul, and that my whole future would be here in this Church. BM – During the last few months we have witnessed atheist campaigns, which promoted atheism in some European countries by sticking atheistic posters and messages on buses and subways. There are some folks here in Romania that want to forbid religious symbols from public places, such as schools. They also want Darwin’s theory to be taught in schools. I’d like to ask you where you think Darwin was wrong and where you think his followers today are mistaken? And when I ask you this I have in mind that wherever you go on Earth, specially in the East, mysticism has had a huge influence on people’s life, while atheism never created anything!! Do you think that Christianity brought something useful to the world or just wars and struggles for power? FrA – Atheism is today the fashionable ideology of this world, in all its different forms. Lazy people have made of Darwinism an excuse for not going to church and not trying to improve themselves. Darwinism is a fairy tale, a modern myth in all that it says about humanity. Its truths concern only the physical, animal, insect and botanical worlds and even then only in a limited way, because they are theoretical. To say that the whole universe is an accident is more difficult to believe than a fairy tale. If you can believe that, then you can believe in any fairy tale. How could something as complex as a human brain be the result of a mere chance? How could the presence of trillions of stars in the night sky be the results of mere chance? Common sense tells us that there is a Creator. As I said, Darwinism and its theories are all an excuse by people to justify their sins. And they are encouraged in this by the devil, who does not want people to obtain healing of their sins through leading an Orthodox way of life, obtaining the grace of the sacraments, through prayer and fasting. This whole issue of Darwinism is an illusion. Darwinism is a theory which can only have been developed by minds which do not believe in God, by intellectuals and fantasists, who do not have an understanding of the reality of the human soul because they spent too much time with animals. So they began thinking that they too were animals. Of course, if you do not believe in the existence of the immortal soul, and have no spiritual experience or life, then human-beings are animals. It is not surprising that Darwinism has been used by the Fascists and by Communists. If only the fittest survive, then, they said, we have the right to kill the weaker or ‘racially inferior’ – as Hitler did, or the ‘class enemies’, as the Communists did. However, our rejection of the illogical and irrational theories of Darwinism does not mean that we accept the strange ideas of the Protestant sectarians, who, not knowing the Tradition, interpret the Bible literally and do not know of and understand the interpretations of the Scriptures by the Holy Fathers, by the Church. To understand the Scriptures, you must have some understanding of the Author of the Scriptures. This is the Holy Spirit, and the Holy Spirit lives inside the Church. This is why outside the Church, you cannot understand the Holy Scriptures. Christ saved the world. He is the Life and the Resurrection. The fact that some evil people use our Christian Faith to justify wars and their evil does not mean that Christianity is bad. It means that the devil, and those he inspires, will always try and discredit Christianity. They simply abuse our Christian Faith in order to camouflage their own sins. If Christianity had no value, they would not do that. The devil always attacks what is best and tries to destroy it. If Christianity had no value, if it were false, the devil would not bother to try and corrupt it. The devil does not attack those who do not repent – they are already his friends. He only attacks those who are trying to repent – therefore his greatest enemy is Orthodoxy. BM – There are some voices claiming that Orthodoxy is holding back progress and that, in general, Christianity is an inquisitorial, oppressive and xenophobic religion. Judging history from way back in time and until modern times, do you think Orthodoxy has been a retrograde factor? FrA – Orthodoxy is progress – but spiritually progressive. Those whom the world calls ‘progressives’ are in fact retrogrades – spiritual regressives. This paradox is because we Orthodox Christians have a radically different systems of values from the world, which ‘lies in sin’ (as St John says). We have an eternal, immortal perspective of life – they have a temporal, mortal one. Their whole ideology is the ideology of death. They say ‘live for comfort, enjoy this life while you can, live as selfishly as you want, because ahead of you there is only death’. But how can you live for comfort, when death hangs over you? We do not love death, as they do, we love the Resurrection. We are not spiritually primitive, we are spiritually advanced – they are spiritually primitive, because they believe in death. BM – Reading about you and about your parish the word diversity came to mind: an Englishmen finds God in the Russian Church, preaches Orthodoxy in Western Europe (where there are mostly Catholics and Protestants), visits Russia and Greece, has in his parish English people, Russians and Romanians, celebrates many religious services in languages other than English, and one of the main protectors of the parish is Saint John (Maximovich) of Shanghai, a Ukrainian by origin. How is it Father, that everywhere you go (in Orthodox places, countries) you feel at home, though Orthodoxy, in a way, is always different and yet the same? What could it be that holds us together, though we are different. Is it Christ’s resurrection or is it just our (religious) pride? FrA – We Orthodox all have the same home – the Church of Christ, which can take us to our home in heaven. We share the same spirit. Things like nationality, our passports, our native language, are all secondary, part of this world. The important things are universal. Our spiritual passport, the only one that can take us to heaven, says that our nationality is ORTHODOX. When you see an old Orthodox grandmother or a baby smile after communion – that is international – that is the language of Orthodoxy. All the rest is secondary. BM – Many Eastern Orthodox, that don’t have much information on Orthodoxy, find it strange when they hear about Orthodoxy in the USA, China, Africa or even in Western Europe. I think we are all curious to hear more about Orthodoxy in England. How do the divine services sound in English and how does Orthodoxy fit in with the English mentality? FrA – The important thing is not the language, the important thing is the spirit. If we keep the Tradition of the Church, everything sounds good. Look at Romanian. One of the greatest achievements of Romanian Orthodoxy in the 19th century was the translations into Romanian. Before that Romanians only had the services in Greek or Slavonic. Does anyone want to go back to the situation of before? When no-one understood? Of course not! If we are faithful to God through His Church, we can use any language. In England, this means using English, the best form of English, liturgical English, which is a beautiful language, not the language of the street. We always give the best of our human culture to God. But we use other languages in church, depending on whom is present. In this way everyone can feel at home and included. The only other difference in our churches is that we venerate local saints, those who were here in the West before Roman Catholicism was invented and the Western schism of 1054, when the West finally broke away from the Orthodox Church and invented all these isms – Catholicism, later Protestantism, Baptism etc. And these were the origins of other isms, political ones, like Capitalism, Communism, Fascism, now Globalism. The Church is never divided, only some groups and individuals fall away from the Church. English and other Western people must accept the Orthodox Church as She is. The Church does not adapt to the world, the world must adapt to the Church. We provide all the services in the local languages of the West. We celebrate them. Then people come, perhaps only a few, but our task is to bring the last free souls of the West to the light of Orthodoxy before the end. If we put the Church first, then an (not just any) English mentality will fit in with it. BM – Father, a few hundred years ago, Christian Europe united and fought against Muslims and the Arab world. Today, Christian Europe supports the building of mosques and welcomes Islam. Don’t you find it weird? Don’t you think that Europe has lost its Christian identity, as St Nikolai Velimirovich said a few decades ago? Could Europe be confronting a demographic as well as a spiritual collapse, or not? FrA – Europe’s collapse is a spiritual collapse. All the other disasters in Europe come from this spiritual collapse – the total loss of faith. If Europe had faith, it would still believe in itself. It would say to Arabs: we are not racist, come and work here and live here, if you wish. But there is one condition. You must first be baptised, But because Europe no longer has any faith, it is ‘tolerant’ to Islam. What does ‘tolerant’ mean? It means indifferent, unbelieving. This is dangerous. This is what makes people tolerant of the devil too. What does it matter what you believe – we must be ‘tolerant’ – satanist or Christian, it’s all the same to dead souls. The demographic collapse of Europe is of the same order. Europe does not believe in life, because it has lost faith in God, the source of all Life, the Maker of Life. Therefore, it believes in death – abortion, euthanasia, all of this is the industry of death and Europe is in love with this industry of death. If Europe believed in the Resurrection, it would never abort its future. The origin of this is in the Roman Catholic and Protestant obsession with the crucifixion of Christ, not with the Resurrection. BM – Speaking of the EU, Romanians are in the middle of a scandal concerning the implementation of RFID chips in passport, ID cards and the driving licence. Though it is not the sign foretold in Apocalypse, chapter 13, many see it as the step just before that, while others disagree strongly, and feel offended in a way by our protests. I wish to ask you: what do you think about RFID chips and how do you see RFID in the future? Do you agree that a police state (Big Brother) is about to be born? Are we living now the beginning of the Apocalypse, or not just yet? Should we even care about this subject? FrA – There are some things which are of primary importance, which we must be willing to die for. The Church dogmas, the Holy Trinity, the Divinity of Christ the God-Man. We must be ready to suffer martyrdom for these truths. There are other things which we regret, but they do not have the same importance. For example, I think that Orthodox would agree that the world would be better without modern TV. But are we going to die for this? No. So it is with these chips. It would be better to avoid them, but if the State insists, then we will accept them. Of course, they are ultimately opening the path to the Apocalypse, but the two World Wars opened the path to the Apocalypse much more quickly. And they happened. We cannot change this. ‘Render unto Caesar the things that are Caesar’s’. Let me make it clear. I do not like these chips, which the EU insists on, but because they will not make me renounce Christ, I will reluctantly accept them, if there is no alternative. I am worried that some very simple, very devout people, with ‘zeal not accordingt o knowledge’, will turn this problem into some huge temptation and in this way they will fall away from the Church. I would call these chips a ‘lesser evil’ in such a case. This is the same with the calendar. In Russia they call the new calendar the Communist calendar, because the Communists introduced it there. Here in Western Europe, we call it the Catholic calendar – because that is what it is. The new calendar is a mistake. But there is a greater evil than this new calendar, it is to start a schism about it, as you have among some zealots in Romania, to fall away from the Church because of it. We make the Apocalypse come near through our soul. As long as there are just a few souls struggling ascetically against their personal sins, the Apocalypse will not come. Antichrist can only come when there is no grace left in the world. Let us belong to the few souls who are struggling ascetically and praying – this is how we delay the Apocalypse. This is much more important than fighting in a secular way against electronic chips. We should pray against them. BM – On the same issue, some bishops said that we must not be afraid of RFID and politicians reject with arrogance the idea that the State could influence in one way or another, our redemption. How do you see the relationship between Church and State? 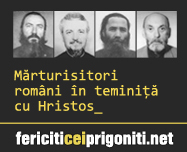 Romanian priests are paid by the State. FrA – The relationship between Church and State has always been one of tension – and it always will be. The Church is ‘n the world, but not of the world’, the State is of this world. When the clergy are paid by the State, they must be especially careful not to become puppets or tools of the State. We must speak by the Holy Spirit, not by the secularist spirit of politicians and bureaucrats. BM – The Romanian Orthodox Church made compromises with the Communists. It’s true that some bishops were killed by the Communists and that thousands of priests went to jail. However, the main idea is that of a compromise. The reason was the „salvation” of the Church. Did the ROC make the right decision? Today, it seems history is repeating itself. How worthy is this kind of compromise? FrA – The Church never makes compromises. The Church is the Body of Christ. The true representatives of the Church were the hundreds of thousands who suffered under the Communists – many of then died. Of course, there were individuals who make compromises, and some of them were bishops and priests. Pray for them because their souls are tormented, because they were not faithful to the Church, but they swam with the tide. I think we must be very careful here. Some people love to condemn bishops and priests for their mistakes. But what would they have done if they had been in their position under the Communist yoke? Maybe they would have made even worse mistakes. On this subject I want to tell you something terrible but true. To those people who condemn the compromised bishops and the priests of the Church, answer this: ‘We get the bishops and priests that we deserve. BM – Last month, at Iasi, after a conference on Communist dungeons and the martyrs who died at that time, a miracle happened. From the bones of those martyrs streamed myrrh. I understand that in Russia they declared these martyrs saints. In Romania the bishops don’t want to do the same. Do you think they’re saints? Do you have a message for the Romanians and for these bishops that doubt it? FrA – To the Romanian people I say: venerate these new martyrs. They are the saints who can save Romania today. In Russia the new martyrs were glorified only because of popular veneration. If you put the bishops under pressure, they will canonise the new saints of Romania. There must be widespread popular veneration first. Paint their icons, make new services to them, go on pilgrimages, write books about their lives, with all the facts and details. This is the most important, vital, thing you can do in the Romanian Church today. Glorify your saints! Eventually the Romanian bishops will meet in Synod and canonise them. In the Russian Church, the great revival now is only because of these New Martyrs and their popular glorification. The bishops will follow the people in this matter. Do not wait for the bishops to lead you in this matter. The people must begin, creating pressure for their canonisation. This is what happened in Russia – through the prayers of the New Martyrs. The devil and the world hate the saints. True Orthodox love them. BM – At the end of this year a big Pan-Orthodox Council is scheduled. Some sceptics say it will teach heresy. But no matter the result, one thing is for sure: there a lot of problems to be solved. What’s your opinion? Particularly if we are to think about what was signed at Ravenna, the Ecumenical Movement will be the main headline. FrA – This Council will not take place so soon. There are many obstacles. Even if it does take place, there is no reason to think that it must be bad. It may solve some problems. As for Ravenna, it was not canonical, it was not signed by all the Orthodox Churches. In any case, there is no such thing as a Council until after its decisions have been received by the Orthodox people. If the decisions are not received by the people, then it is not a Council, it is just a meeting of intellectuals and politicians, Church bureaucrats, secularists in riassas, government agents. It is a Robber Council, irrelevant to us. BM – Returning to more important things, tell us something from your missions across Europe. You must have something to say! What were the good and the bad things you’ve stumbled upon? Which are the places you want to visit again and where would you like to go, where you have never been? What are the people from Western Europe like, compared to the those in the East? The tendency is to make the first devilish. FrA – I cannot leave my church, but if I could, I would travel to all the many parts of the Orthodox world, where I have not been. I am especially drawn to Bukovina and Moldavia. And I would like to return to Athos and then go to Diveevo and Optina in Russia. But God will give me this opportunity only when I am worthy of it. And then I have never been to Jerusalem and the Sea of Galilee. But as God wills. Western people are more rationalistic than Eastern Europeans. Eastern Europeans are more spontaneous, they have more soul. If their souls are good and Orthodox, then you at once feel at home. Western people are always thinking, always calculating, less spontaneous, their souls are not so visible. This is because of the deformations of Western culture, which have taken place since 1054. This can be very boring. Orthodox have fire in their souls, they are spiritually alive. On the other hand, many Eastern Europeans have abandoned God and so their souls have become full of passions. And that can be very bad, as we saw under Communism. BM – What are the main sins that affect the world today? What we should give up and what to gain in order to save our souls? Are we redeemed alone, or as a nation? Can we still talk about nations today? FrA – The main sins are the same ones as always. There is nothing new under the sun. Just the excuses for the sins change. Now we blame the internet, or TV or something else. We have to return to the Church, in many cases discovering the Church for the first time. We find redemption personally, but one soul that finds salvation can save thousands of others around. Nations are falling apart today. They can survive only if there are enough strongly ascetic souls to maintain their national identities and keep their peoples together. BM – Everyone is talking about a crisis: financial, energy, spiritual… Some Elders and Holy Fathers think that the crisis means God’s Judgement for the world’s sins. But for those atheists and philosophers that reject this explanation, could the rationing of water, the prohibition to have more than one child, be real solutions? FrA – The word ‘crisis’ is Greek. It means judgement. If humanity repents, everything is possible. Humanist, atheist measures merely delay the crisis, they do not solve it. The crisis is still there and does not go away. This crisis will be permanent, if there is not repentance. BM – Science is focused on improving the pleasures in life and getting rid of pain. They’ve found „cures” for fear, inhibition, and so on. Alvin Toffler, in his book Future Shock, writes that all this mechanism is set against us, and the consequences, as he writes, are recognized today, world wide. Did we make out of science a God, as St Justin Popovich says? Are we slaves of technical discoveries? In what way can this „enslavement” affect our lives, our redemption? Can we hold television for ruining young people’s lives? Can we achieve a goal in life through technology? FrA – Science is simply modern idolatry. Science is the knowledge of creation. Ancient idolatry was about the worship of the creation. Modern idolatry is about the worship of the knowledge of creation, of science. This is just as primitive as the idolatry which worshipped the sun, the moon, mountains, stones, seas and rivers. The ancient idolators were slaves of their idols, making human sacrifices to them – so we are modern slaves, making human sacrifices to the science of Chernobyl or embryo technology. This idiolatry means that we are no longer free to worship God, the Creator. We cannot worship both creation and the Creator. This is obvious. We should not blame TV for corrupting us. We always seek to blame others! We corrupt ourselves through our attachment to such things as TV. We have to be free. Christ said: Behold, I set you free’. TV is not in itself evil – we have made it evil. The same thing has happened with every human invention, from the knife to the gun, from the mobile phone to the computer. We make them all evil. Look at space. The first satellites went there fifty years ago. Now what do they do, they militarise space, they have ‘killer satellites’. If human beings go and live on the moon, what will happen? They will start killing each other there, just like on earth. A goal in life through technology? This would mean that our goal in life is slavery. BM – Father, everything is happening so fast around us, as if we don’t have enough time. Stress is the main word for each of us. It even affects the Church. It might be a foolish question, but how can we get rid of stress? More and more people are depressive. Especially in the West, with this financial crisis… We see in the media, TV, newspapers, many youngsters that are upset with life and choose to kill others in their path. They take a gun and just shoot everyone they meet, and then kill themselves. How come? Could it be that most of them, almost all of them, are treated for depression? Who’s to blame? Education? Friends? Television? FrA – Lack of prayer is to blame. Without communion with God, the human being goes mad, because where there is no prayer, the demons invade. These young people who go berserk and shoot ten or twenty people, are possessed by demons. The demons are killing. Demons have no bodies, they need bodies to operate through them. This is why they possess people. It is very easy to do this now, because so many people, especially among the younger generation, are not baptised. The modern world is calling up all the demons from hell. Soon, if this continues, God forbid, hell will be empty, for all the demons will be on earth. FrA – The Holy Scriptures explain who God is, how He loves us and how we can communicate with Him. The Holy Fathers help us to understand the Holy Scriptures. Science explains, or tries very weakly to explain, how God creates. The two things are quite different. The Scriptures only get dusty if we behave like atheists and leave them lying on a shelf. My Scriptures are not dusty. BM – You wrote some books. Can you tell us more? FrA – I have written six books in English. They are to help English people or English-speaking people come to the Church, explaining culturally what Orthodoxy is and why they have norational reason to reject the Orthodox Church. BM – Are they available on the internet? How long has it been since you last published a book? FrA – One is on the internet as an e-book. I have not written a book since 2000. Everything I write now is on the internet directly. BM – We’re close to the end of this interview and I’d like to ask you just a few questions. How do you see the world’s future, and if you would have the power to do something about it (let’s say king for a day), what would you do? Would you talk to people? Would you pass a law? FrA – The world is advancing rapidly to its end, but this ‘advance’ can also slow down. The end may still be far off. To slow down can only come though repentance. There is only power that I would like because there is only one power which can really change anything. And that is the power of prayer. Sadly, my prayer is very, very weak. To be a king for a day or to pass laws is useless. Politicians are only manipulated themselves. Only prayer, the force which does not depend on this world, can change anything in it. Only prayer sets an example. Words are weak. With prayer you can send back the demons to hell, where they belong. Without prayer, this is impossible and the demons wander all over the planet, creating destruction, suicide, misery. FrA – I meet two sorts of Romanians here. One sort of Romanian is admirable, an example to all Western people. These are the Romanians who live their faith. The other sort of Romanian is Orthodox, but Orthodox by folklore. For example, only two weeks ago, I had a Romanian come to me to get married. She had already organised the secular ceremony, the flights for relatives from Romania, the reception, the food, the drinks, the dance music, everything. But then she had thought of the Church, as a kind of extra. Sadly, she had planned to get married on a Saturday. I said I could not do this because the Church forbids weddings on the day when the Church remembers the departed and when we should be preparing to take communion on Sunday, the day of the Resurrection. We have weddings on Sundays. She was very sad. All this happened because she had not thought of the most important thing, the Church, first. She said that she would go and find another priest who would marry her on a Saturday, if she paid him. Politically, today Romanian is faced with a choice. One choice is to take the road that leads to Western Europe, EU secularism. If you take that road, then in a few years time you will have young Romanian people shooting their school friends, mosques everywhere in Romania, Romanian politicians voting for euthanasia, making abortion and contraception freely available to thirteen year-old girls, just like in England, France, Germany, Finland or the USA or any other Western country. Then you will stop being Romanians. You will have become part of Babylon. The other choice is hard. It is the road of Romania’s spiritual history, the road of your spiritual identity, the road of your Romanian saints, including the new saints of the twentieth century. The first road is the road of death, both physical and spiritual suicide. The second road is the road of Resurrection, the road of life. It is the choice of the historic Romanian people. As a member of a nation which has tragically chosen the first path, I warn you against the first road. BM – Thank for your time, which I know is very precious, as well as for your kindness in granting me this interview. God bless, and may God help us all. Have a peaceful Easter. FrA – Hristos a Inviat! BM – Adevarat a Inviat!